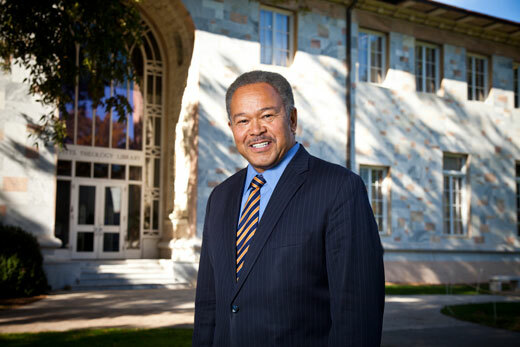 Emory President Claire E. Sterk announced today the appointment of Robert M. Franklin as senior adviser to the president. Franklin, the inaugural James T. and Berta R. Laney Chair in Moral Leadership at Emory's Candler School of Theology, brings a broad portfolio of academic leadership and faculty experience to his newest Emory appointment. In addition to his tenure as the tenth president of Morehouse College, Franklin has served on the faculties of Emory, Harvard and the University of Chicago. An ordained minister, he is nationally known as a scholar, teacher and author of books and public commentaries on spirituality and faith in African American communities and families. Franklin has served as president of the Interdenominational Theological Center, the graduate theological seminary of the Atlanta University Center consortium, and as theologian in residence at the historic Chautauqua Institution. Franklin sees local liberal arts colleges and HBCU members as natural pipelines for recruiting graduate students and faculty to Emory and higher education in general. By introducing those students early to the opportunities offered by a global liberal arts research university with a strong academic health center, he hopes to spread the reputation of Emory as a welcoming community where these students can flourish and grow. He also sees important connections to be made between Emory and local faith communities, enabling the groups to work together to solve the societal, ethical, leadership and spiritual challenges of modern life. Now in his second term at Emory, Franklin previously built a national reputation here as director of Black Church Studies at Candler as well as Presidential Distinguished Professor of Social Ethics and senior fellow at the Center for the Study of Law and Religion at Emory Law. Franklin’s service as special adviser dovetails with his current teaching role at Candler. In his courses, he leads students through explorations of moral leadership in the 21st century in different cultures and contexts in the United States and around the world. Last year, the course culminated in a trip that immersed students in lessons of moral leadership in South Korea, and this semester, Franklin is shaping plans for the class to explore lessons of moral leadership in Haiti.